Scientists have many ways to see deep into the ocean floor and read its history. For Donald Forsyth, however, few images are more compelling than a nicely dispersed “Rayleigh” wave — a type of seismic wave associated with earthquakes and the movement of magma within Earth. 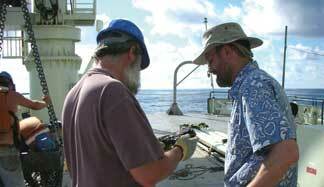 Searching for clues to how melt is generated in Earth’s mantle, Donald Forsyth (right) studies basalt dredged from the seafloor at the East Pacific Rise, a fast-spreading mid-ocean ridge. Photograph is by Benjamin Friedman. “I just love data,” Forsyth says. “I get a thrill out of looking at patterns, or trying to make patterns out of chaos.” In a career spanning more than 30 years, Forsyth has sought to understand how Earth works — trying to solve “difficult puzzles,” he says, such as investigating the processes that form Earth’s ocean crust, drive heat flow within the mantle and control the motion of tectonic plates. Forsyth started small, he says, spending his first post-undergraduate summer studying subatomic particles at the Argonne National Laboratory in Illinois. As an undergraduate physics major at Grinnell College in Iowa, Forsyth knew he wanted to apply his studies to more concrete problems, but was not yet sure which questions to tackle. After exploring nuclear physics at Argonne, however, he decided he wanted to explore physics on a larger scale, “something that you could visualize,” he says — so he applied to a broad range of graduate programs that all happened to have “physics” in the title, from astrophysics to geophysics to physical oceanography. At MIT, he worked with marine geophysicist Frank Press, studying the evolution of the ocean’s upper mantle. Since then, Forsyth has found many different ways to examine seismic structure, tectonics and gravity anomalies to determine how Earth’s crust and upper mantle develop and change with age, including how magma forms at mid-ocean ridges and where it goes. In 1995, he led the pioneering Mantle Electromagnetic and Tomography, or MELT, experiment, one of the largest marine geophysical experiments ever undertaken. MELT deployed a large-scale network of seafloor instruments that measured long-period seismic waves and magnetic fields, allowing scientists to “see” deep into the mantle beneath the East Pacific Rise. With that data, Forsyth and others made the surprising discovery that the magma that rises and becomes new crust at the mid-ocean ridge is generated in a broad zone deep in the mantle and wells up off-center beneath the ridge, rather than in a narrow zone directly below it, as earlier models had suggested. Forsyth plans to continue exploring where the data leads him, following up the MELT experiment with further investigation of the structure of the upper mantle around the East Pacific Rise. He is also collaborating with other earth scientists on the EarthScope project, a National Science Foundation-funded geophysical observation network to investigate the structure and evolution of the North American continent (see Geotimes, April 2002). His expansive approach to research, using a variety of geophysical techniques to study a wide range of geological questions, earned Forsyth the Geological Society of America’s Arthur L. Day medal in 2005 — an award of which he says he is particularly proud, as his mentor Frank Press also won it in 1972. In April 2006, Forsyth was also elected to be a member of the National Academy of Sciences.